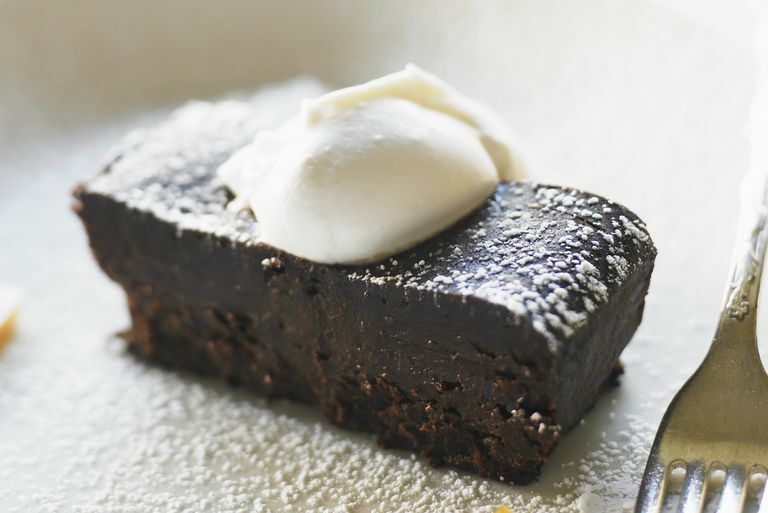 One of the best things about this flourless chocolate cake is how easy it is. The entire thing can be mixed up in the food processor in about five minutes. I get requests every year to bring "that yummy chocolate cake" to Passover Seder: I just leave out the baking powder and it only makes a small difference. I used to make it with sugar, but no one really noticed when I switched. It's especially nice with some homemade whipped cream and a little sugar-free chocolate sauce on top! Ground pecans add depth of flavor and richness to the cake. Along with eggs and melted butter, this is a decadent dessert. Yet, since it's flourless and sugar-free, it's still low in carbohydrate. Heat oven to 350 F. Grease an 8" or 9" round cake pan or springform pan. Place pecans in the bowl of a food processor. Pulse until they are finely ground into meal (they won't get quite as small as corn meal). Add the eggs, melted butter, vanilla extract, artificial sweetener (if using in liquid form) and water and process until well-blended. Pour the cake batter into the prepared pan and bake until done (toothpick inserted in center comes out clean.). The exact time it takes to cook will vary with depending on your pan. Start checking at about 25 minutes. When done, remove cake from oven and let cool on a wire rack. To remove cake from pan, run a knife around the edge of the cake to loosen. If using a springform pan, open the lock to release the sides. If using a regular cake pan, place a plate on top of the cake pan and invert, tapping the bottom of the pan to release the cake. Cut and serve with homemade whipped cream and/or chocolate sauce, if desired. How Do You Make Pumpkin Pecan Pancakes That Are Gluten-Free? How Do You Make a Gluten-Free Pumpkin Roll with Cream Cheese Filling?